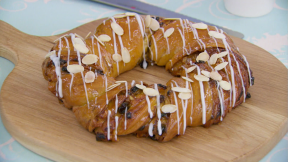 This apricot couronne recipe appears as the technical challenge in the Sweet Dough episode of Season 2 of The Great British Baking Show. Tip the flour into a large mixing bowl and add the salt to one side of the bowl and the yeast to the other. Add the butter, milk and egg and mix to combine, using your hands. Continue to mix until you’ve picked up all the flour from the sides of the bowl. Use the dough to clean the inside of the bowl and keep going until you have a soft dough. Tip the dough onto a lightly floured work surface and begin to knead. Keep kneading for 10-12 minutes. Work through the initial wet stage until the dough starts to form a soft, smooth skin. When the dough feels smooth and silky, put it into a lightly oiled bowl. Cover the bowl with a tea towel and leave to rise for one hour, or until doubled in size. While the dough is rising, make the filling. Beat the butter and muscovado sugar together until smooth. Drain the apricots and add to the butter mixture along with the flour, raisins, walnuts and orange zest. Mix to combine. Turn the risen dough onto a lightly floured surface. Taking care not to knock the air out of it, roll out the dough into a rectangle, approximately 33x25cm/13x10in. Turn the dough 90 degrees if necessary, so you have a long edge facing you. Spread the apricot mixture evenly over the dough. Roll up the dough tightly (like a Swiss roll). Roll it slightly to seal, then cut it in half lengthways (you can leave one end joined to help you twist the dough and form the circular crown). Twist the two dough lengths together to make a rope, then join the ends of the rope to form a circular ‘crown’. Transfer to the baking tray. Put the tray inside a clean plastic bag and leave to prove for 30-45mins, or until the dough springs back quickly if you prod it lightly with your finger. Meanwhile, heat the oven to 200C/400F/Gas 6. Bake the couronne for 25-35 minutes, or until risen and golden-brown. Set aside to cool on a wire rack. Gently heat the apricot jam with a splash of water, then sieve it and brush it over the warm loaf to glaze. Mix the icing sugar with enough water to make a thin icing, drizzle over the loaf and sprinkle with the flaked almonds. Leave to cool before serving.